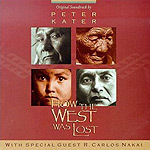 CD review: "How the West Was Lost"
The soundtrack for The Discovery Channel miniseries of the same name, "How the West Was Lost" (which aired last week), is a musical interpretation of the battle between the native American and European cultures from the indigenous point of view. And yet, there isn't a whole lot of original native music here, only a few tracks by the White Oak Singers and a Lakota flute played by R. Carlos Nakai. The rest of the 65 minutes of music (culled from the more than three hours' worth on the show) is mostly compositions by Kater and Nakai, employing native structures and rhythms, plus instrumentation. With grand, sweeping themes and a rich wall of sound, "How the West Was Lost" has a soundtrack feel to it more than a native American vibe.